What do you think about cycling in Cardiff? Come and tell us! 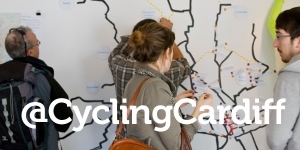 Cardiff Council, in association with ARK LAB are asking for your feedback on Cardiff Council's Draft Cycling Network Strategy. This strategy aims to develop and expand the cycling network within Cardiff and encourage more people to choose cycling more often. On 16th of October we will be taking over 107 Queen Street (opposite the Capitol Shopping Centre) and we would like to invite you to come and give your opinion. If you can't make it - don't worry you can still join in! We will be running consultations on Thursday 21st and Saturday 23rd October at the same venue. In addition we will launching an online survey later on in the week which we will keep you up to date with. We will also be running a variety of fun and useful events, here's the programme so far: • Saturday 16th October - 10am-5pm 11am -12pm & 3pm - 4pm - drop-in cycle accessories craft workshop suitable for supervised children and adults• Thursday 21st October – 10am – 7pm 11am -12pm & 3pm - 4pm drop-in cycle accessories craft workshop suitable for supervised children and adults 1pm - 2pm Lunchtime Event - talks from invited guests and groups• Saturday 23rd October - 10am-5pm 11am -12pm drop-in cycle accessories craft workshop suitable for supervised children and adults 12pm - 1pm - Lunchtime Event - talks from invited guests and groups 1pm -4pm 'Dr. Bike' - bring your bike in and Cycle Training Wales mechanics will diagnose the problem & will take you through basic bike maintenance demonstrations Keep your eye out for regular updates on the full programme on our facebook page and on Twitter @Cardiffcycling Please pass this information on to anyone who you think might be interested.